As with this time last year, there is growing excitement for the forthcoming release of a new Star Wars film, this time Rogue One. All the new toys have only just hit the shelves, and we were fortunate to be sent one from the most desirable range; LEGO. 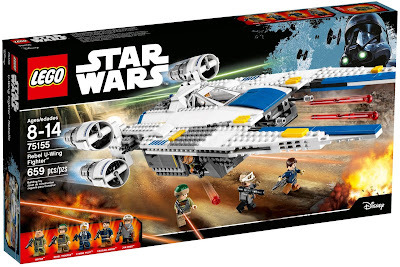 We check out the LEGO Star Wars Rebel U-Wing Fighter set (#75155). The U-Wing Fighter is impressively long at around 40 cm in length. It is very sturdily build, with plenty of Technic pins and parts used in the internal construction to keep it all together, especially when attaching the underneath troop carry pod to the topside ship. Right... the figs! The set will definitely be of interest because of the inclusion of these two named characters; Jyn Erso (L) and Cassian Andor (R). Jyn comes with what we can only imagine is a rocket launcher of some sort, and also a soft fabric cloak and bag accessory. Both have alternate faces with great amounts of printed detail throughout. We're pretty sure this is the only set that includes Jyn, so collectors will go nuts for it. 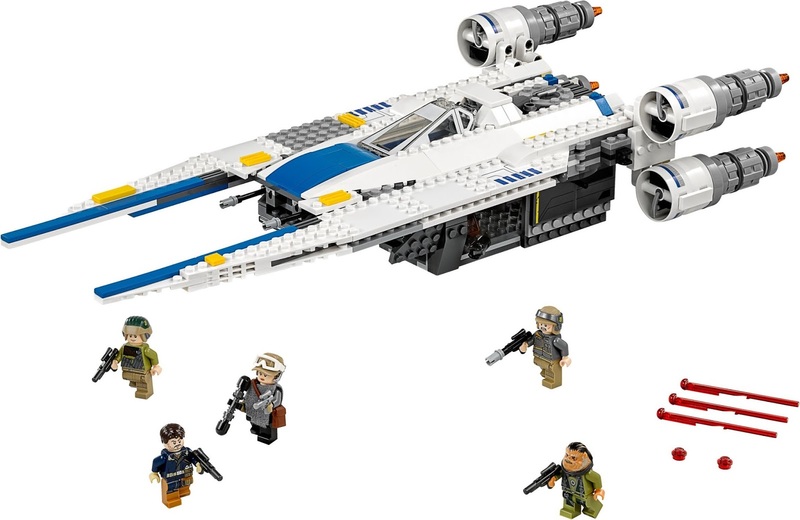 Also included is named character Bistan (L), and then a Rebel Trooper, and the U-Wing Pilot. Again, all three look fantastic, mixing a tough military appearence with what we've come to expect from Rebel faction minifigures before. Okay, the ship itself. There is something amazingly familiar about the U-Wing, and we suspect that the film's designers have drawn upon Ralph McQuarrie's Star Wars sketches from the 70s. It is a perfect blend of X-Wing, A-Wing, and Republic Gunship, and the colouring and lines are spot-on for Rogue One's A New Hope-ish setting. Also, notice how it isn't perfectly symmetrical, with slightly differing details on the side wings? Speaking of wings, it has 'em. The sides split open to form a more aeroplane look, which perhaps it uses when flying through an atmosphere. The wings lock firmly into both positions, so no worries about them coming loose during play. But boy does it make a large model even larger. The underside troop pod features doors on each side that swing open using more Technic parts. Once open, two little stud shooters can be deployed, with places for figures to sit behind and man them. The pod also has room enough for everyone in there, although getting them in is a tad tricky. Up front, the U-Wing has laser cannons backed-up with real spring-loaded shooters. LEGO are getting great at hiding the firing mechanism of these things, and the U-Wing is no exception. See the two slightly raised blue tiles? Those are the firing buttons. Nice work guys. The four engines are heavily borrowed in style and shape from an X-Wing, but the construction also reminded us of last year's Naboo Starfighter set. The grey part inside the engine in-takes is actually an axe. ...actually opens for a ramp, although you can't get anything in there. We're not sure if this is a detail of the 'in-universe' ship, or just the parts that LEGO used to get the angle right. ...they nudge open the cockpit canopy. The thing is so deeply placed into the body of the surrounding ship that opening it by hand is quite fiddly - hence the great mechanism. When open you can see that, at the Pilot's feet, there is a lot of light coming in. That is because of this large transparent piece up front, acting like a secondary windscreen. This is probably used in the film so the pilot can see the ground he's landing on, and the whole thing goes togther very well. The piece is actually the canopy from the huge UCS X-Wing set. The whole look of the ship is geared toward war, and plays in well with what we've seen so far of Rogue One itself. It's aggressive, but also delightfully 'hand-made', which nails the Rebel aesthetic from A New Hope perfectly. CHARGE! With the figures emerging from the pod it looks pretty sweet, and we can see how kids will enjoy recreating the battle scenes from the film (once they've seen it). The LEGO Star Wars Rebel U-Wing Fighter is bound to clog up the underside of many Christmas trees this year. Yours should definitely be one of them.